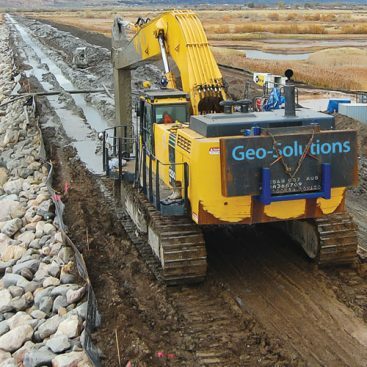 Geo-Solutions was contracted to install a Cement-Bentonite cutoff wall. The cutoff wall was designed as part of the construction of a cofferdam. 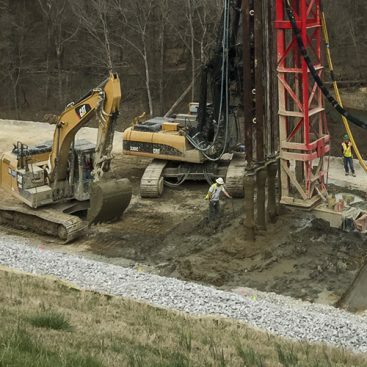 The cofferdam and associated excavation is being completed to allow the construction of a new hydroelectric power plant along the Ohio River at the existing Meldahl Lock and Dam. 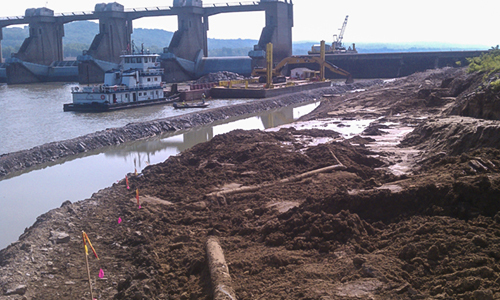 The cutoff wall was installed to seal the cofferdam from intrusion of water from the Ohio River. A cement-bentonite wall was selected by the Engineer to provide a combination of low permeability and stability in the cofferdam. The specifications for the finished wall are performance based. The slurry wall contractor was responsible for developing a slurry mix design that would meet the specified strength and permeability. Geo-Solutions led a mixture of Ground Granulated Blast Furnace Slag, Bentonite, and Portland cement for this project. This type of Slag-Cement, Cement-Bentonite slurry has been used successfully in the past to achieve strength in a cutoff wall without sacrificing permeability. The length of this cutoff wall is 3,575 linear feet with a depth of 70 to 80 feet for a total of 271,000 vertical square feet. The wall is 30-inches wide in the majority of the alignment. 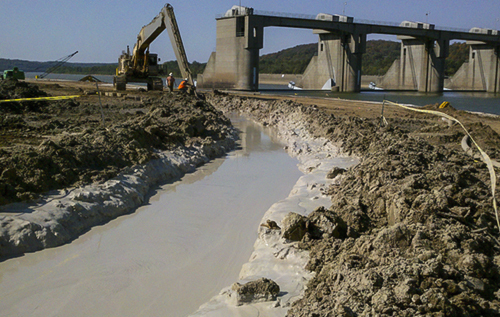 The cutoff wall was installed over the existing concrete dam. In this area, the cutoff wall was widened to 6 feet wide to ensure a seal at the interface of the cement-bentonite slurry and the existing concrete. Since this site was in the area of previous dam construction, a pre-excavation of the cutoff wall alignment was required. This pre-excavation was done to clear the alignment of any existing construction or other debris. 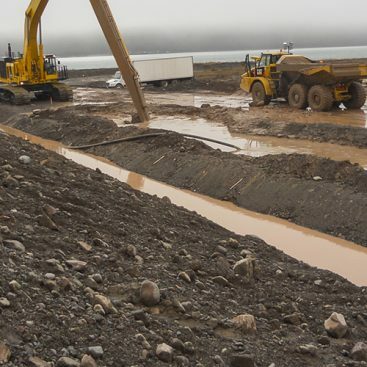 The pre-excavation was completed under bentonite slurry that was used as temporary shoring. The trench was backfilled with excavation spoils prior to the start of the Cement-Bentonite (CB) cutoff wall. The design parameters of the CB wall called for strength (UCS) of minimum 20 psi and a permeability of less than 1×10-6 cm/sec. Field samples of the in-trench slurry were taken at least twice per day and remolded into cylinders for laboratory testing. All other quality control tests were done on site by the Geo-Solutions Project Engineer. These tests included unit weight, viscosity and pH CB slurry. 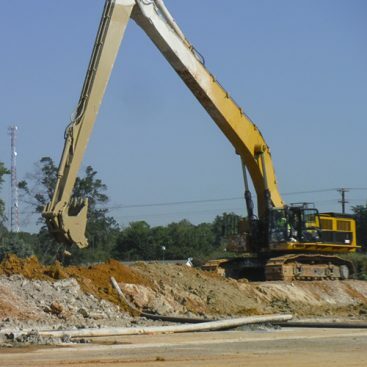 The significant challenges on the project were due to the nature of the site soils. The soil profile consisted of silt and sand for most of the depth of the alignment. At approximately 10 feet above the bedrock, a densely compacted layer glacial till existed that required significant excavation effort. The key-in layer was limestone bedrock that was impenetrable to excavation. The specification required that any weathered rock be removed and a clean contact with the bedrock be made.